It’s my birthday, and I’m in Stitch! 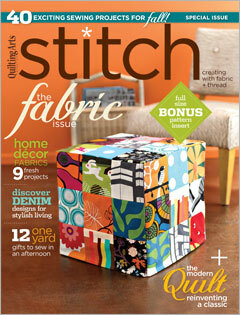 Pick up a copy of Quilting Arts Magazine’s special Fall 2010 issue of Stitch, turn to page 69, and there’s a new sashiko project in there from me! It’s a birthday present from me to you. Today I’m packing up orders that came in over the weekend, and updating the shop with new and vintage kimono fabrics, some of which I’ve been hoarding for years but have finally decided it’s time to let go of. Expect to see some really beautiful Japanese silks including early 20th century kimono panels and remnants from late 20th century kimono silk bolts. Very pretty stuff. Congratulations and happy birthday! I’ll look for the magazine next time I’m at a store.